Did early humans communicate with cave signs? While cave paintings have long been cited as early evidence of human art, Canadian anthropologists believe that abstract signs and symbols in European caves may represent "the first glimmers of graphic communication” among humans before the written word. Deep inside the Oxocelhaya cave in southern France, Canadian anthropologist Genevieve von Petzinger points at a small red marking barely noticeable on a rock wall. It looks like someone deliberately drew an X using two inverted V's. The faint sign is partly covered with calcite, evidence it was traced a very long time ago. Incredibly, it's been sitting there since the Ice Age, some 10,000 to 40,000 years ago. While cave paintings have long been cited as early evidence of human art, anthropologists are now taking a closer look at the significance of strange abstract signs – including spirals, ovals, handprints and intersecting lines – found alongside prehistoric rock art depicting animals. Von Petzinger, a PhD student at the University of Victoria who has been studying prehistoric signs in European caves for a decade, says they suggest "the first glimmers of graphic communication" among human beings before the written word. There was "an incredibly pivotal moment in human history when we went from spoken language to making these durable marks, which could then be communicated to people who were outside of the physical realm of speech distance," says von Petzinger. If true, this represents a major milestone in the evolution of our species, says von Petzinger. Think of it as an ancient precursor to Twitter tens of thousands of years before writing was invented by the Sumerians in Mesopotamia in approximately 3,000 B.C. Von Petzinger came to this conclusion after studying published inventories of over 300 archaeological sites and conducting her own research in 52 French, Spanish, Portuguese and Italian caves. She classified the signs in categories and entered them into a database to track trends over geographical space and time. 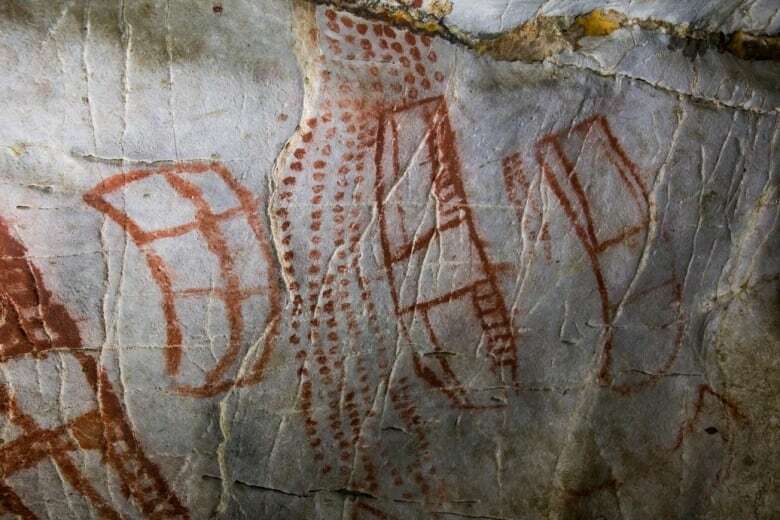 New research suggests that markings on cave walls such as these ones from El Castillo in Spain may have been part of a graphic communication system from the Ice Age, long before writing was invented. (Dillon von Petzinger)Her analysis shows that over a 30,000-year period, cave dwellers used only about 30 different types of signs. "Obviously, we don't have anybody we can ask what the signs mean," she says, "but they were using them in a way that suggests their usage was intentional and that they wished to transmit messages with them." University of Victoria anthropology professor April Nowell agrees the signs weren't randomly drawn. "If it was just doodling, if it was just random, then you would expect to see something as common as a dot or a spiral or something like that in all the caves," Nowell says. "In fact, we see that they don't appear in all the caves and each of these signs seems to be more popular at a certain time and then disappear. They emerge in one geographic region and then spread across, say, from Spain to France." Writing on the cave wall? Up near the ceiling of La Pasiega cave in the north of Spain, there's a series of red marks on a line that look eerily like a row of ancient letters. These are not really letters, but there's something going on, according to von Petzinger. "It's certainly not writing yet at this point but writing didn't come out of a vacuum," she says. True writing systems consist of sets of symbols and rules about how to combine them, so that they can represent almost anything, from concrete phenomena to concepts, categories or sounds. Prehistoric signs don't have the complexity of a writing system but they do qualify as an early form of graphic communication. Could we ever figure out what these signs meant? There's no prehistoric Rosetta stone to help scientists crack that Ice Age code, but von Petzinger is looking for recurring clusters of signs, hoping to find patterns that may offer clues. "I won't be able to tell you… that it says, you know, 'Grog was here' or something like that," says von Petzinger. "I focus more on trying to look for patterns of behaviour. It's an indirect way of me being able to say that they were communicating with each other." While analyzing her initial data, von Petzinger made a striking discovery: 65 per cent of the signs she identified seem to have been in use at the time modern humans arrived in Europe about 40,000 years ago. She says that in the caves she studied, lines, ovals, rectangles and circles are not only in use, "but they're already being used in what's looking like a systematic, very intentional way. So when I see that, it doesn't look like a beginning, it looks like something that's already in practice." The early signs may have been part of a cultural toolkit our ancestors brought with them when they left Africa, the birthplace of our species. This appears to be quite a paradigm shift in archaeology. Experts have long believed that our ancestors' arrival in Europe gave rise to a cultural explosion and the emergence of truly modern human behaviour, because much of the world's Ice Age art - including the famous animal imagery - was found there and dates from after that time. Von Petzinger's findings, along with several recent archaeological discoveries, suggest that abstract thinking may have emerged in Africa. Engravings on ancient ochre sticks and ostrich eggshell fragments found in South Africa suggest the use of geometric markings by modern humans may reach back much further in time, to almost 100,000 years ago at least. "We know that people in Africa were symbol users," says Nowell. "They were modern, they had modern anatomy like us, and so we suspect that they had language and so on. So it's quite possible that the people moving into Europe were already bringing this repertoire of signs with them." "This is our story as human beings of how did we become us, and when did we become us," says von Petzinger. Grog may have been much smarter, and closer to us, than we ever thought.